436 pages, 5.5" x 8.5"
This is the best- and longest-selling book on close combat in history. 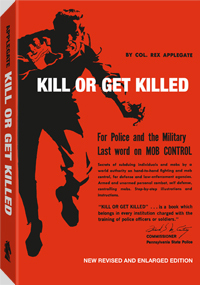 Reprinted and in current use by the U.S. Marine Corps as an official training manual, it details methods of self-defense, offensive close combat, combat shooting and crowd-control techniques in riot situations. This book by Colonel Rex Applegate is considered the standard by which all other books on the subject are judged. The late Colonel Rex Applegate was universally recognized as America's foremost authority on close combat with or without weapons.